Andhra Loyola College in-order to make the students to be the winners in all aspects started a Skill - oriented program "MUSHROOM CULTIVATION", on 25/6/2016. This helps the Students to face the competitive world in a different way. Dr. B. Siva Kumari and Mr. Sarat Chandra acted as resource persons. Students paying attention to lecture on How to cultivate the Mushrooms. Students involvement in preparing the Mushroom cultivation Beds. 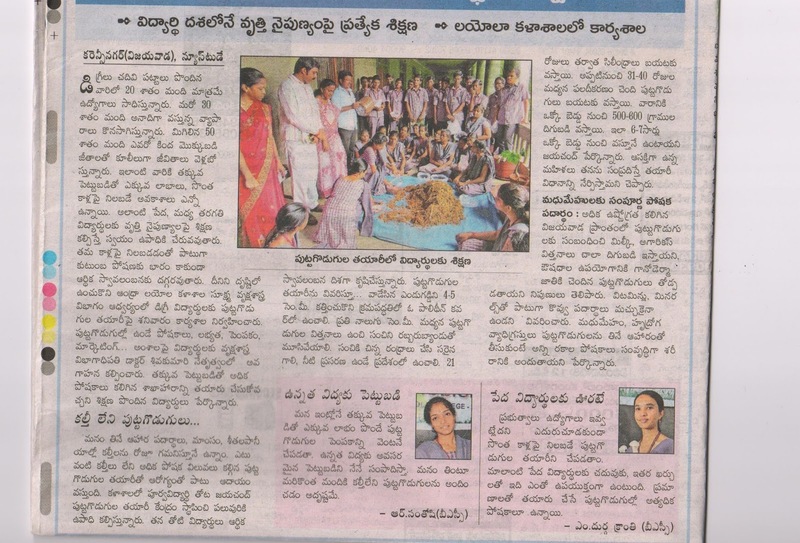 Ms. Santhoshi sharing her view to the press reporter about her experience in the workshop. Fr.Correspondent giving Inaugural message on Mushroom Cultivation Workshop. The Departments of Botany, Microbiology & Biotechnology organized a DBT sponsored Guest Lecture on “ New Frontiers in Biological Sciences” by Prof .S. Sita Rama Rao, Dept .of Botany, Osmania University, Hyd on 23rd June 2016 in old Seminar Hall of our College. Inaugration of the Guest lecture by Plantation with Chief guest and all the Faculty members. The Resource Person of the day, Prof. S. Sita Rama Rao, Dept of Botany, Osmania University, Hyd delivered a talk on the Stressed on Physiologic through the Pictographic examples of various plants and their importance and survival under different stress conditions. He also encouraged the students regarding the current research issues. Research and Development is essential in the field of Biological Sciences in order to face the emerging demands for the production of various substances from the living organisms which are used for the prevention and cure of diseases in our daily life. The Programme was monitored by Dr, B. Siva Kumari, DBT Coordinator, Mr. P.Srinivas Rao, HoD of Botany, M. Glory, HoD Dept of Microbiology and Ms. V. Kavitha, HOD Dept of Biotechnology, all the Faculty members and Students participated in this Workshop. Rev .Fr Melchior in addressing the people during Inaugration. Students listening to the Guest lecture. 1 Plantation drive- Dated on 20-06-2016. The Department of Botany and NGC organized a plantation drive dated on 20-06-2016 Monday. Sri Ravella KishoreBabuGaru, Honourable Minister for Social Welfare and Mayor of Vijayawada city, Sri Koneru Sridhar Planted a sapling Infront of Lagadapati Block(LB-Block). Total 200 students participated in this programme. Dr.B.Siva Kumari Co-ordinator, DBT& NGC, Mr.P.SrinivasRao, HoD,Department of Botany monitored the programme.Total 200 students from various extension wings participated in this programme. Minister Sri Ravella KishoreBabuGaru, and Principal Father in Plantation work.